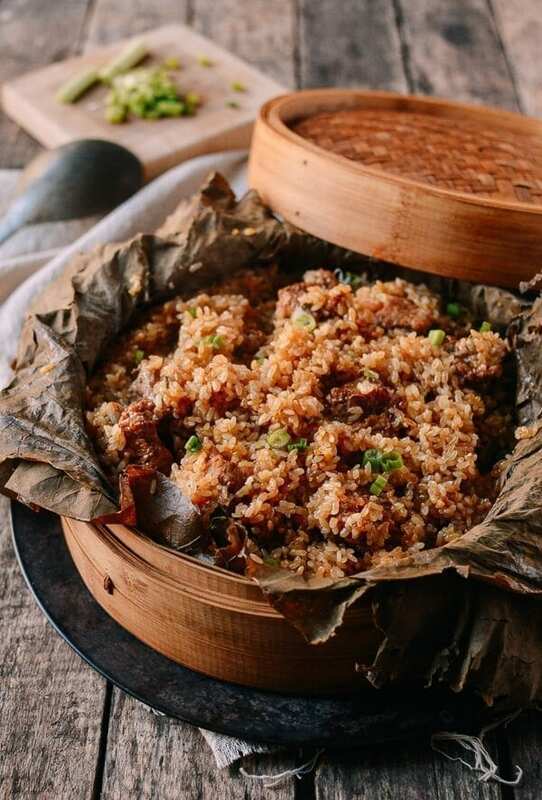 Steaming food is just as important in Asian cooking as baking or roasting is in Western cooking. 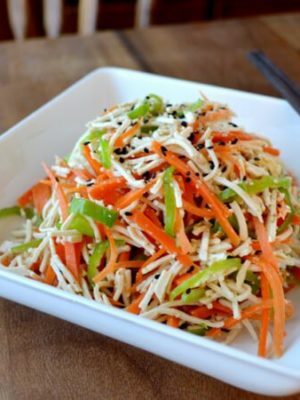 Chinese and other Asian cuisines feature steamed vegetables and proteins, but also steamed buns and breads, dumplings, and even desserts. 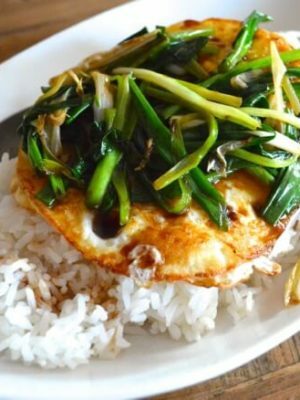 Knowing how to steam food, therefore, is a crucial skill in any Asian kitchen. 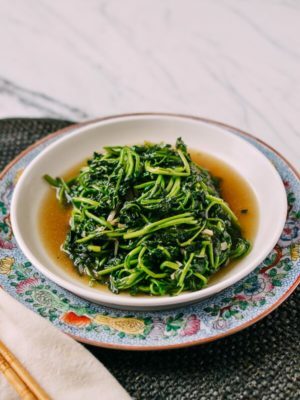 But while the idea of cooking food using hot steam seems pretty straightforward, the task of steaming food or even just knowing how to set up a steamer for cooking may be a little muddy and foreign to some of our readers. 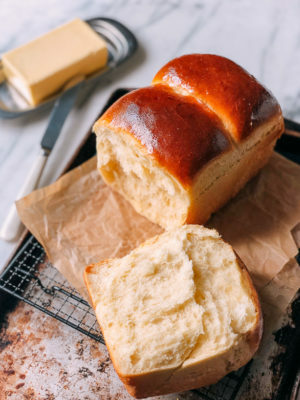 In this post, we’re going to go over how to steam food for a wide range of recipes. 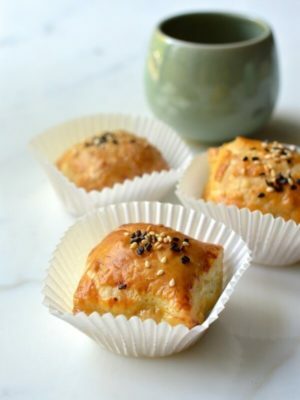 I include here three different ways to steam food, from a steaming setup you can probably already create in your kitchen without any special equipment, to a traditional bamboo steamer, to a more modern stainless steel steamer. My steamer serves two purposes in our kitchen: to cook and to re-heat. 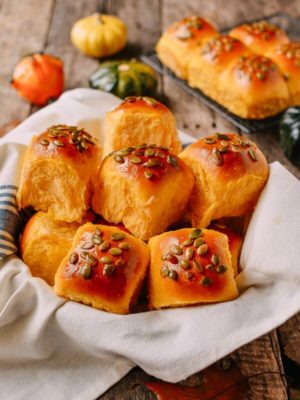 If you simply search the term “steamed” in our blog’s search bar, you will find a wide range of recipes: buns, veggies, meats, seafood, and desserts. 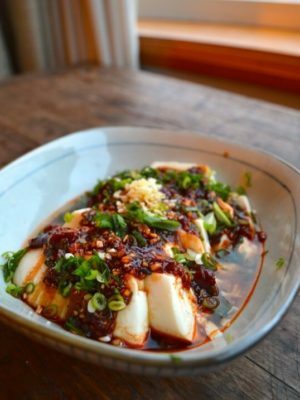 Steaming food requires little to no oil, making it a lighter cooking option, but it also is a necessary cooking method for many traditional Chinese dishes, from Hunan Steamed Fish with Salted Chilies to Cantonese Steamed Milk Pudding. 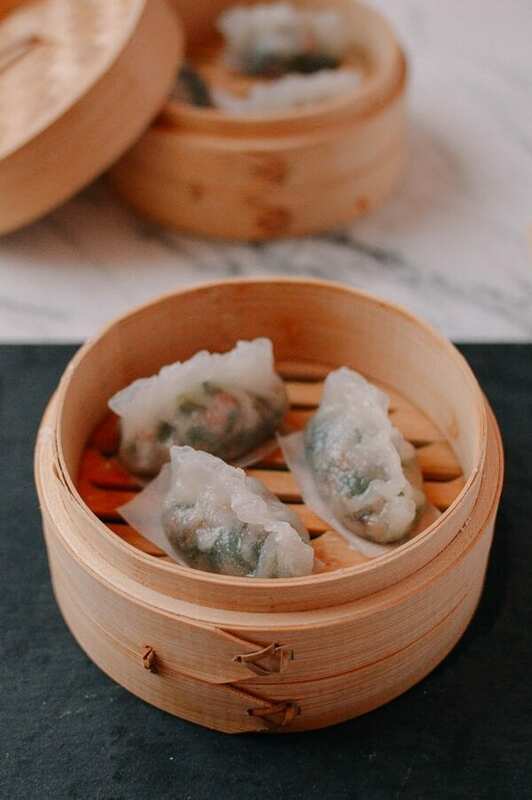 Also, the majority of Dim Sum dishes––beloved by many––are steamed, like Crystal Dumplings, Har Gow, Spare Ribs with Black Beans, and Shumai. Moreover, I’ve never really accepted the concept of using a microwave for cooking or reheating, so I rely on my steamer to reheat food as well. 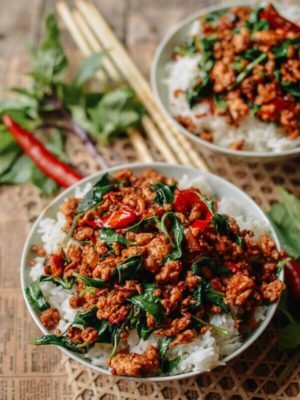 It’s a great way to quickly reheat any meat dish, rice dishes, and more. Here is my rule of thumb for reheating anything: oven-baked things should probably be toasted/reheated in the oven. 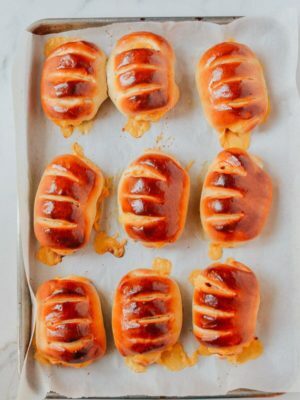 Pan-fried items can be reheated in a pan with a little oil, and pretty much everything else can be reheated in a steamer. I steam food daily, to heat up leftover rice, to steam yams when I’m looking to be healthy, or to steam some Chinese sausage along with my cured pork belly (which is what we had for dinner tonight!). Really, I can’t live without my steamer! The purpose of this post is not to sell you on expensive steamers. 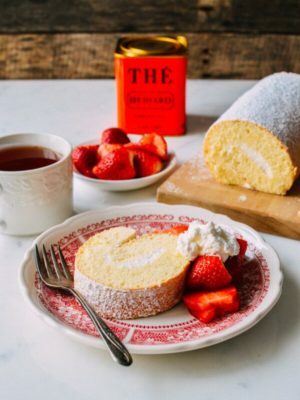 As I mentioned earlier, I’m going to share a few common steamer set-ups with you––all of which I use in my kitchen, and how I’ve taught my own girls to steam food in their apartment kitchen. 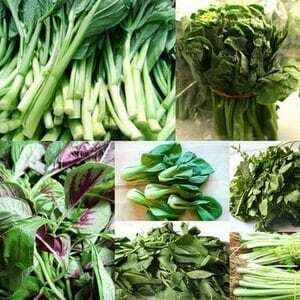 You don’t need any special equipment to steam food. 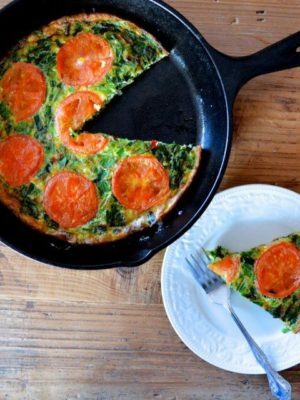 A pot with a lid works just fine, especially when it comes to reheating food. There are metal steam racks or stands that you can buy for just a few dollars, but you can also use a heat-proof bowl or an empty steel can (next time you use a can of tomatoes or beans, carefully wash out the can and save it for this purpose) to prop up the dish. Larger, wider cans work better for this purpose, because they provide a more stable surface to put your food on. Sometimes, even if I have a metal steaming rack, I will also use a can to raise the food higher above the water, especially if I’m going to be steaming for a long time and need to use more water. 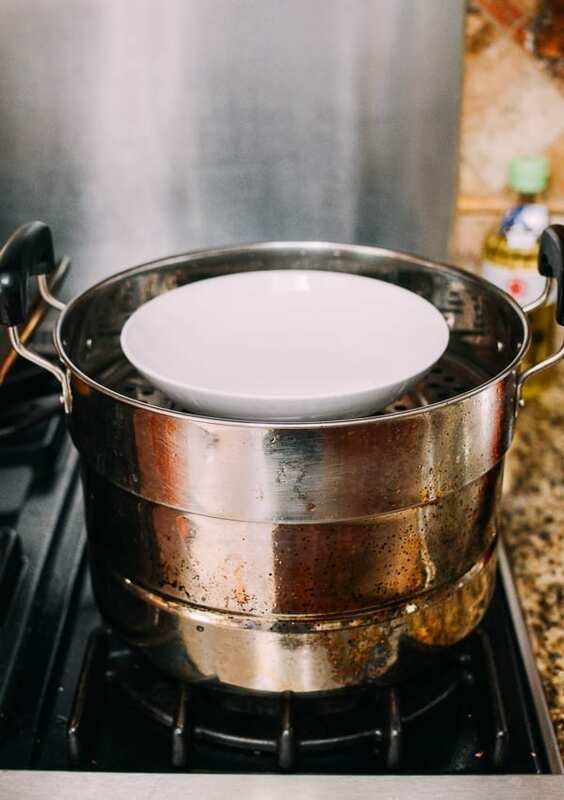 Simply fill a pot with 2 inches of water (or a little more depending on how long you need to steam the food), and put a steaming rack or empty can in the center of the pot to set your plate of food on. You can even use a heat-proof bowl. Make sure that any plate/dish you’re using to hold the food is heat-proof. 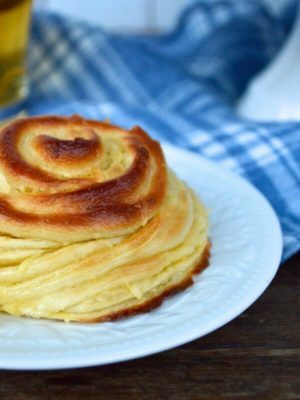 Another thing to consider is whether or not your dish should have a rim. 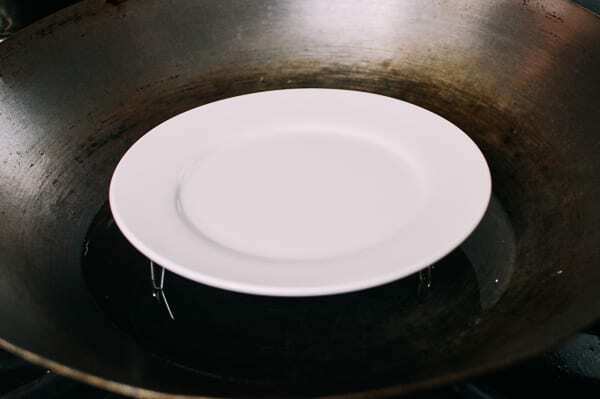 If you’d like to save any liquid from steaming (which is usually the case when steaming proteins like chicken), make sure your dish has a rim to keep the liquid in. A pyrex pie dish, or other dishes safe for oven use, will work well. Once the dish of food is positioned on your rack over the water, cover the lid. Note that there must be enough space between the outer edges of the dish and the sides of the pot so the steam can come up and cook the food. Simply turn up the heat to medium/medium high to bring the water to a simmer, and your food will steam! 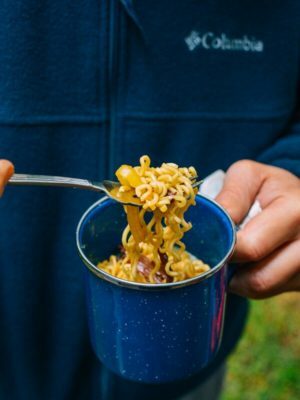 When we travel in the RV or go camping, this method comes in handy for all our steaming needs, since we only have basic kitchen tools to work with on the road. 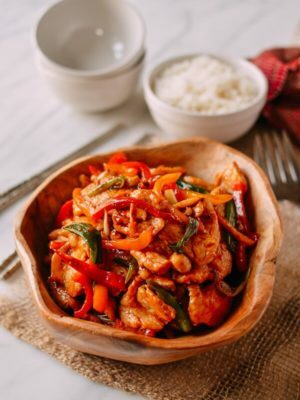 On one final note, while this method works in a regular large pot, it works especially well in a wok with a lid, because woks have a larger diameter than normal pots and can therefore fit large plates of food for dishes like steamed whole fish. 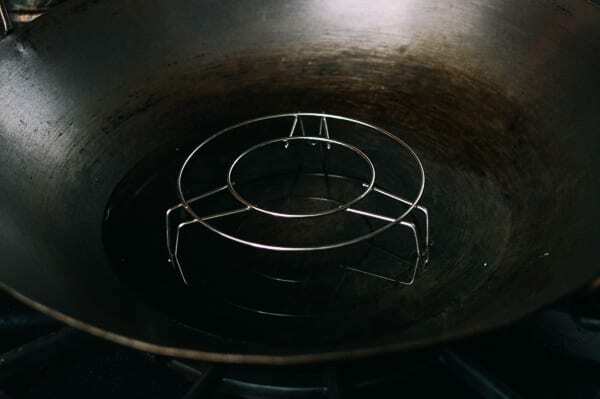 Also, wok lids tend to be more concave than regular pot lids, creating a dome inside the wok with more room for the steam to circulate above the food. I steam food so often that to me, owning a stainless steel steamer is a no brainer. 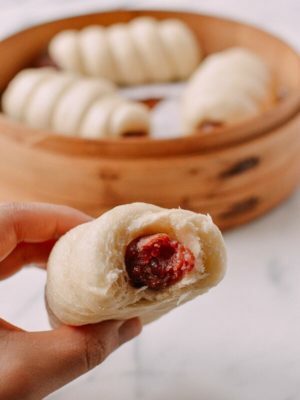 It’s a user-friendly tiered steamer that will allow you to steam either a single level of food, or to use three different tiers for big batches of buns/dumplings or cooking several different steamed dishes at once. 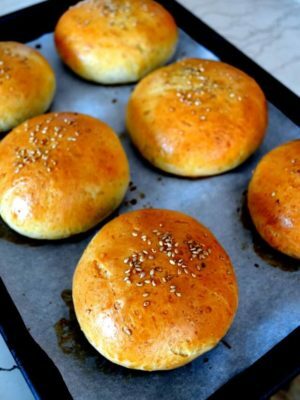 Or you could line the tiers (which have holes in them to allow the steam to come up) with cabbage leaves or parchment paper and place buns or dumplings directly on top. The one downside of this type of steamer is that condensation can collect on the lid and drip down on your food. 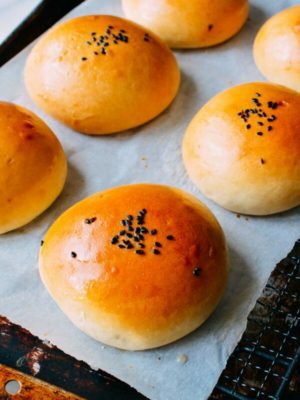 It’s a relatively minor concern for many steamed dishes, but for steamed buns, breads, and cakes, it can be a downside. I like to use bamboo steamers the most. 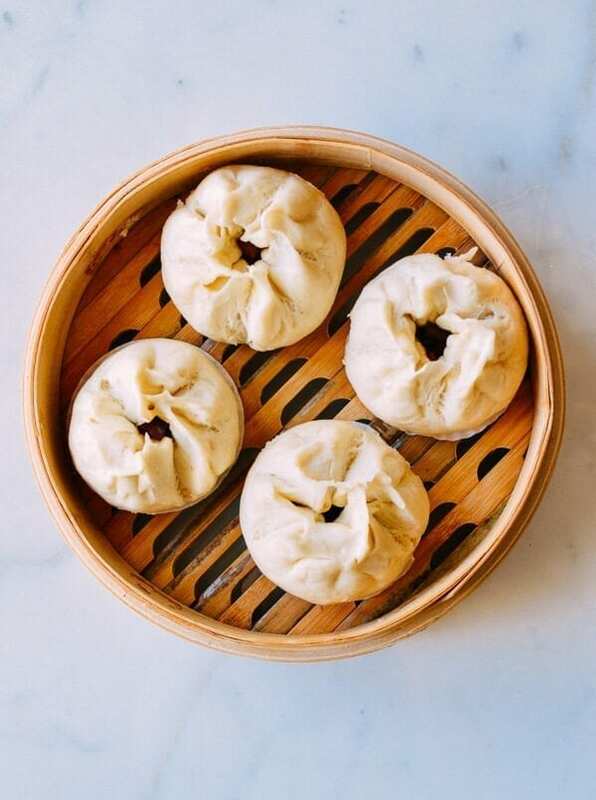 The biggest upside is that the bamboo steamer cover does not collect condensation, so I never have to worry about water dripping onto steamed buns and cakes to alter their texture or appearance. 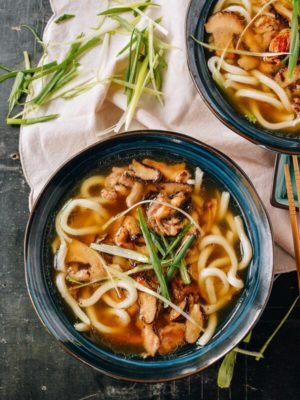 To use a bamboo steamer, simply place it in a wok with enough water to come up above the bottom rim of the steamer about a quarter inch or so. 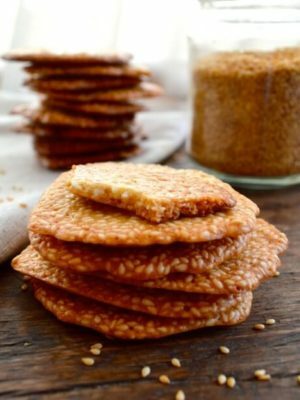 This is the only downside of using a bamboo steamer––it’s a little bit less fool-proof. 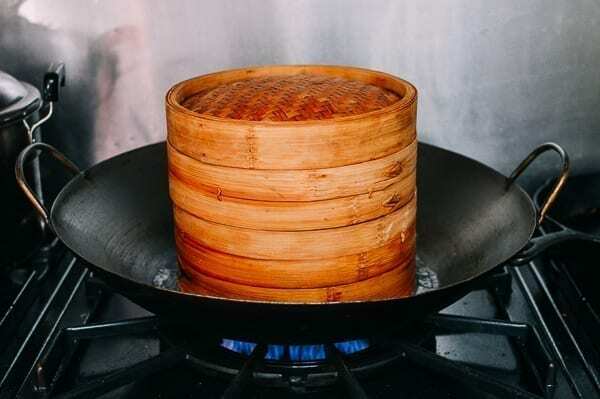 The bamboo steamer must sit in water at all times to prevent the bottom rim from getting scorched, but you can’t overfill the water, or it’ll touch the bottom of the inside bed of the steamer and therefore the food on top of it. This means you have to keep an eye on it, and keep adding boiling water as needed as the water in the wok evaporates. This can be a little bit troublesome for long steaming processes. 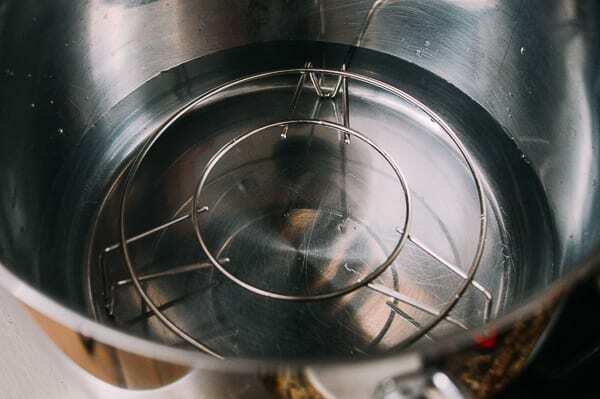 However, if you have both a stainless steel steamer AND a bamboo steamer, you can remedy this issue if your bamboo steamer can fit in the bottom tier of the stainless steel steamer. You can buy bamboo steamers in all kinds of sizes, but I find that a 10-inch steamer is the one I most often use. Some people like to use metal steamer baskets to steam food. While this type of steamer basket may be great for steaming loose vegetables like broccoli florets, it’s not as versatile as the other steamer setups I’ve mentioned above, which is why it didn’t quite make the list. I do own one of these, but I rarely use it! What I do consider to be an essential tool for any of the steamer setups above, however, is a plate gripper like this one. 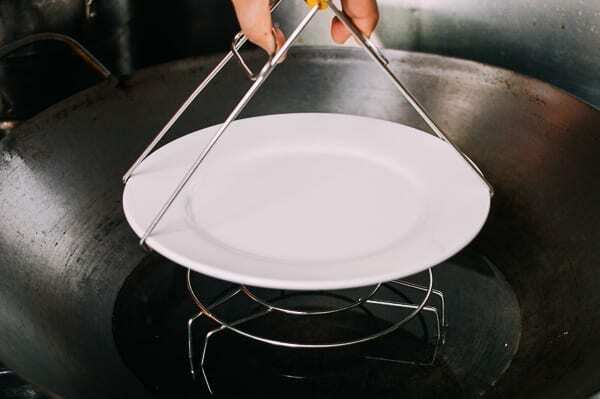 This tool resembles a pair of tongs, and it essentially allows you to grab the rim of a hot plate to remove it safely from the steamer without having to use your hands or fingers. 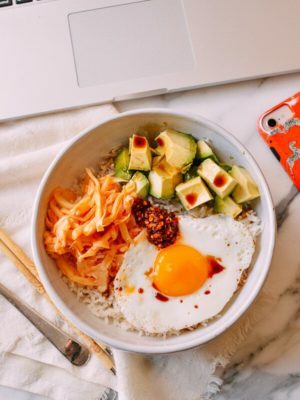 It also allows you to life the plate straight up out of the steamer, without having to angle the plate at all or jostle the food on the dish, which may slip off the plate if you attempt it any other way! 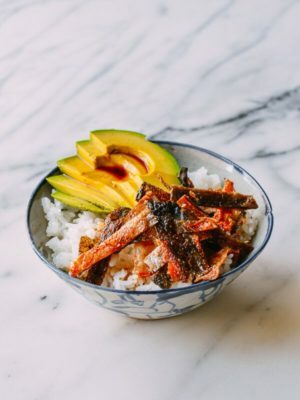 (Bill once steamed a plate of fish and tofu, turned around too fast while holding it, and everything went flying onto the floor!) Note that if your steaming dish has sides but no graspable rim, you won’t be able to use this tool with it. In any steaming situation, there will be boiling or simmering water involved. The water level is very important to pay attention to. 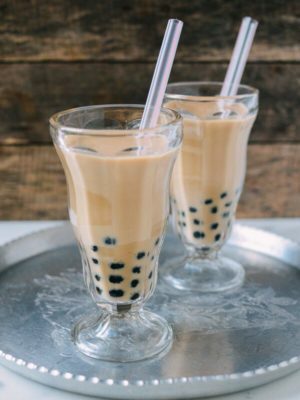 When the water boils, it will bubble upwards––always make sure that your food is high enough above the water such that the bubbling water can’t touch the food during steaming. 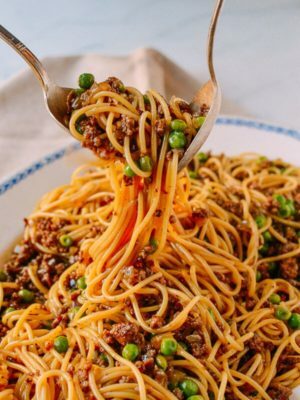 Likewise, be careful not to use too little water, or the water can evaporate completely before the food is done steaming, scorching the bottom of your pot or steamer. 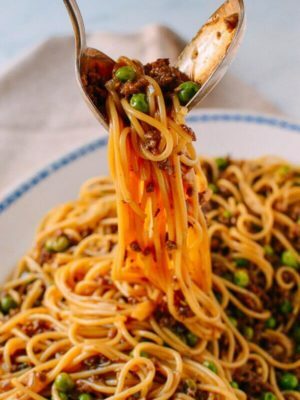 If a recipe asks for 1 hour of steaming, you will need at least 2 to 3 inches of water in your steamer, though it will also depend on how high your cooking heat is and how fast the water is evaporating. 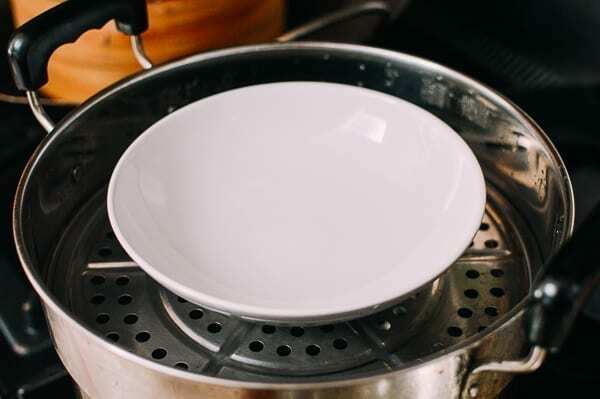 When adding water during steaming (in the case of using a bamboo steamer especially), use boiling water to keep the water temperature consistent. Using cold water will make the water stop boiling, interrupting the steaming process. Remember, when steaming anything, that steam cooking your food is extremely hot, and it can be dangerous. Be very careful when opening the lid of any steamer, as the hot steam escaping can burn your skin. Also be careful when removing anything from the steamer. For me, steaming is always done on stove, and never in the oven because it’s not an efficient use of energy. And that’s it! 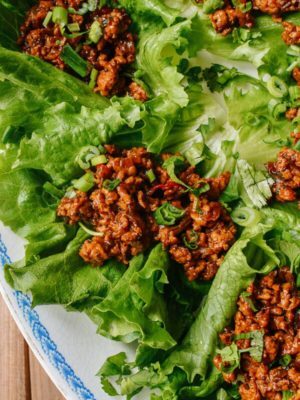 Three simple methods to steam food. Any other questions on steaming technique? Let us know in the comments! 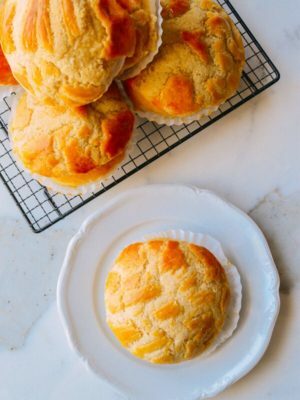 Simple tips on how to steam food, from vegetables or proteins to buns, dumplings, & desserts––even without special equipment. 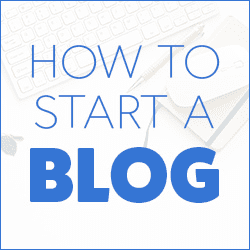 Here are 3 ways to do it. 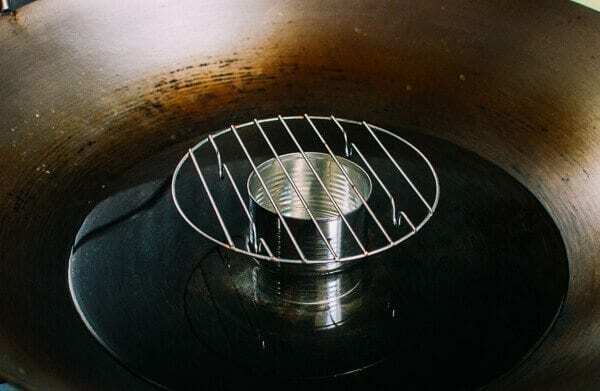 At a place called the wok shop is SF CA is got an aluminum adapter with 7″ diameter opening, allows 8″, 10″, or 12″ bamboo steamer to be used with an ordinary pot. Frees up your wok so that you can stir fry and steam simultaneously. Place water in pot, adapter sits on the pot and bamboo steamer sits on the adapter. Steam travels upwards and steams your food. Very practical, affordable , easy storage. Like Martin I too use a steamer ring with my bamboo steamer. Although mine came from Amazon. I use my ring with 10 inch frying pan. These work so well that I really don’t understand why more cooks don’t use or don’t know about them. Especially if you have an induction or electric stove. Just google “cooking ring” and buy one. That should have been Steamer ring. Thank you for the tip, Martin. I learned so much from this article, thanks! I happen to have a pot the same diameter as my bamboo steamer, so I always used it balanced on the edge of said pot, and it has gotten scorched on the outside. No more! The other really useful thing was finding out about those plate grippers. I just had major sauce spillage last week, so I ordered one right away. It arrived today, and it came with a thin silicone (?) disk about 3 1/2” in diameter. Does this have a use? Is it supposed to go under the food plate? Hi Cheryl, I believe the silicone disk is also a plate gripper: fold the disk in half and grip the plate in between. You can use it to assist the metal plate gripper. Or not––not sure it’s all that necessary. Thank you for providing these tips! Hi Sam, thank you for your comment. Your steamer setup is perfectly fine. I did not want to provide your method and send people out to match a bamboo steamer to a perfectly sized pot. Very helpful. Mostly I’ve used my steamer for steamed pork buns. I can go beyond to next level; vegies and sticky rice surprise. 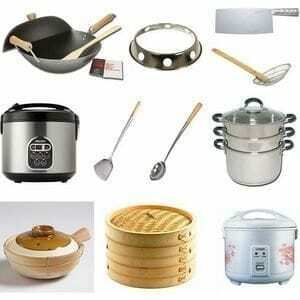 I recently read on a different blog that I should use a dedicated wok for steaming with a bamboo steamer. I noticed that I did lose some seasoning on my wok after steaming with it. I’ve only had the wok since Christmas but have used at least twice a week to build up the seasoning. Now I have a rusty bald spot in there. What do you recommend? Hi Barbara, if that’s a concern, you can buy a large stainless steel steam pot, big enough to fit your bamboo steamer on the bottom rack, with the ability to still put the lid on. I think that will work out the best. The bamboo steamer would be my preference, but the one I used to have gave the food some non-food taste that discouraged its use. How does one pick a bamboo steamer that doesn’t do that? 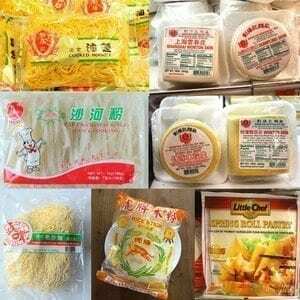 Hi Jane, pick a bamboo steamer without any “finish” on it. It should look like the color of unstained wood. Would you care to comment on proper care/washing of the bamboo steamer (if you don’t have a dishwasher) and when you should or should not use some type of liner (cabbage leaves, parchment paper etc). I second this question! What is the appropriate way to clean a bamboo steamer? Not only after use, but upon finding one full of dust after sitting unused for a LONG time! Also, are they dishwasher safe? Hi Jeanette, definitely do not wash your bamboo steamer in the dishwasher. I usually just wash it with dish detergent, brush it lightly with my vegetable brush, and then rinse it thoroughly under warm water. The most important step is to leave it out to dry completely (sometimes it takes a couple of days) before storing it away. Hi David, pls do not wash your bamboo steamer in the dishwasher. It will definitely damage it over time. I usually just wash it with light dish detergent, brush it lightly with my vegetable brush, then rinse it thoroughly under warm water. The most important step is to leave it out to dry completely (sometimes it takes a couple of days) before storing it away. As for the liner, it’s a good idea to always use a liner. Thanks for this very detailed post with all the different options and of course very useful photos (after all, picture tells a thousand words, rights?) ?. 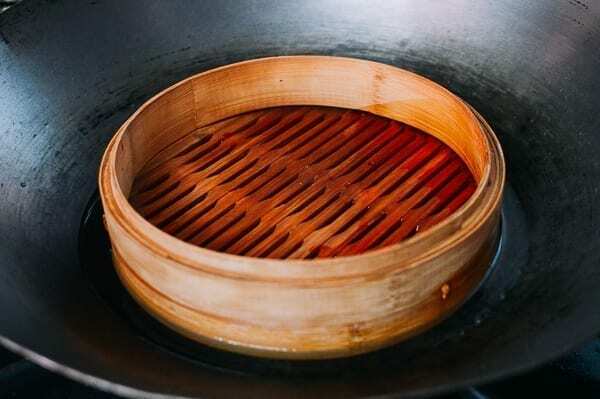 I always wonder how one can use the bamboo steamers directly over an uncovered wok -1) would lots of steam escape and fill up the kitchen with condensation, especially for lengthy steaming? and 2) with all the heat lost without a metal hard cover, would it take much longer to cook the food, especially like pork dishes? 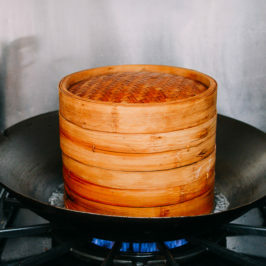 Some suggests to wrap a piece of cloth/towel under the metal lid of the stainless steel stacking steamers to absorb the moisture and reduce condensation dripping on the food, does this work and what about steaming multi-layers at the same time-like 2 big pans of turnip cake for CNY?? Would you have to wrap the bottom of the lid and bottom of the top stack of the steamer? I recently bought a Cuisinart ‘combi’ steam & toaster oven hoping it can allow me to avoid being out the big wok or steamer. 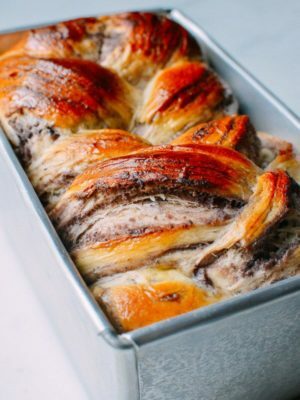 While I don’t think it generates enough steam (or has the space) for major steaming recipes, it’s great for reheating left overs, veggies and breads…love multi-task kitchen appliances. 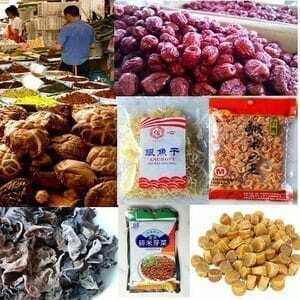 Your website is my ‘Go To’ resource for all my Chinese cooking and more. 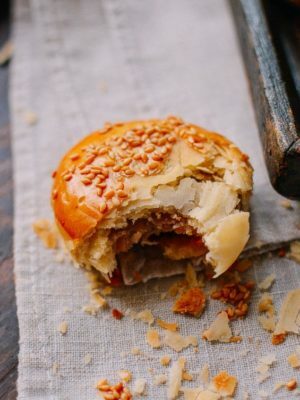 Especially helpful for my ABC children who grew up with authentic tasting Chinese dishes but have no clue how to prepare them. Now I just send them a link to your site. Can’t thank your family enough ???. 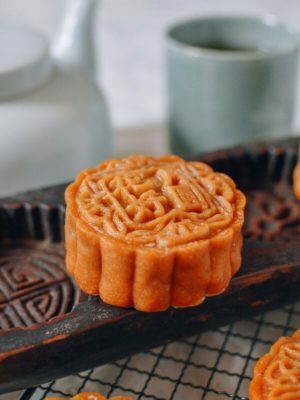 Hope you enjoy the big moon and some sweet rice balls for the 15th of Jan (元宵節）yesterday. Thank you so much, Karen! 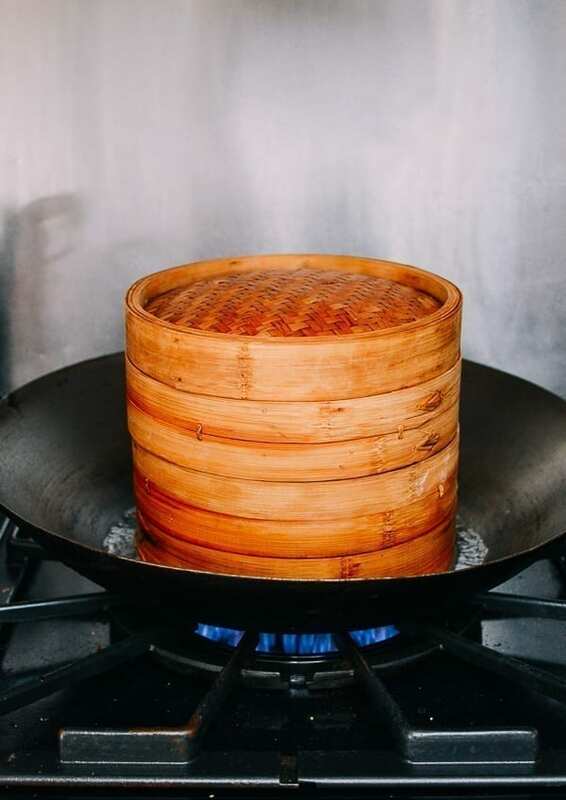 With a steamer directly above an uncovered wok, most of the water/heat is actually under the steamer, so with the bamboo steamer’s lid on, the majority of the steam stays in the bamboo steamer. The escaped steam (from the sides) adds moisture in the house and some condensation on the windows if it’s really cold out. All in all, I have not found that it affects the cooking time. There will be condensation in a metal steamer––no way around it. It’s fine for steaming fish, chicken, vegetables. 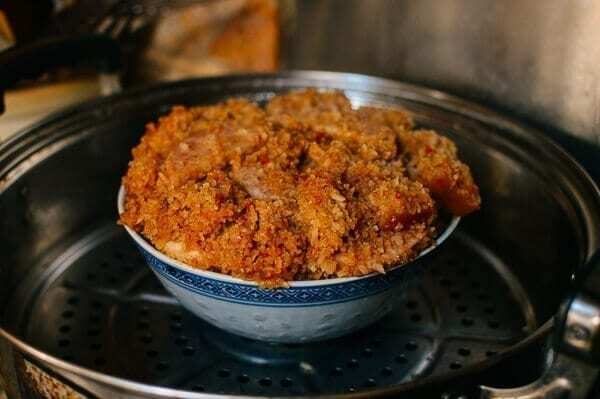 But try to avoid steaming buns, cakes and dumplings in metal steamer. I have heard that some people do wrap towels inside and around the lid of the steamer to absorb the condensation though! Interesting! I have a bamboo steamer basket although it is only one tier but I’ve never used it, I will give it a try now. I tend to steam in plastic steamers in my microwave. I also like Dorine Kings’ idea about the frying pan. I have a hare enough time keep my woks clean and the patina intact. Great article on steaming! I too, use steaming to re-heat foods. Mostly I use a bamboo steamer in a large flat frying pan — I try not to use my wok because I don’t want the patina and not stick to go away. 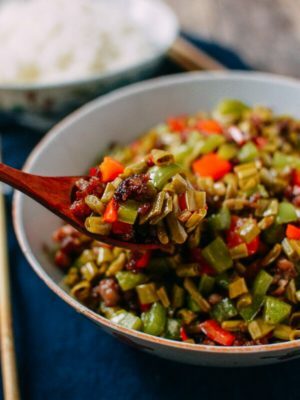 Do you use a separate wok for steaming? Hi Dorine, I mostly use my stainless steel steamer daily. I do use my wok for steaming sometimes, and I do notice that it affects that finish on my wok, but I usually just scrub the wok and oil it, and a day or two later it’s all good again.